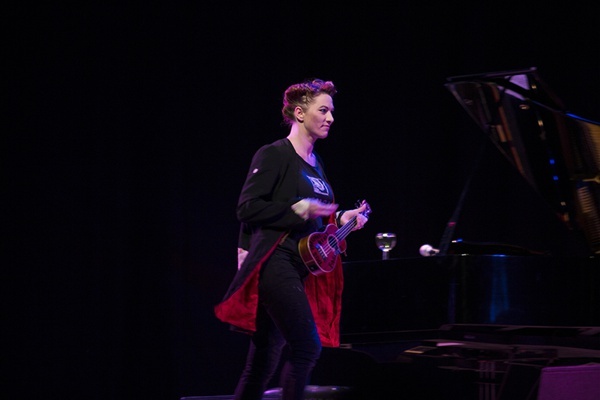 This was a bit different from the other times I had seen Amanda Palmer live. It was just her and a piano on stage, and that was it. Apart from the support, of course, which was comedian Andrew O'Neill, who I have also seen on numerous occasions. 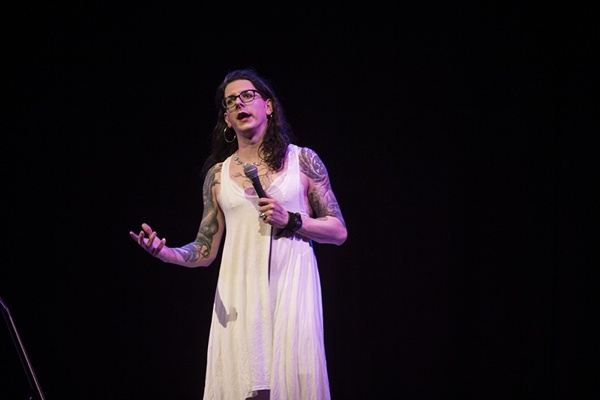 He came on stage wearing a white dress, not unlike the one he wore with his band The Men Who Will Not Be Blamed For Anything at Download in 2016. He then went on to explain some of the problems of being a transvestite after he had demonstrated how racism starts. He is always funny every time I have seen him and an excellent opener for the evening. At eight, Palmer came on stage armed with her customary ukulele and broke into 'In My Mind' before she then sat at the grand piano. Donald Trump naturally got a mention, and we were not really aware at that time, but it was going to be a long evening. 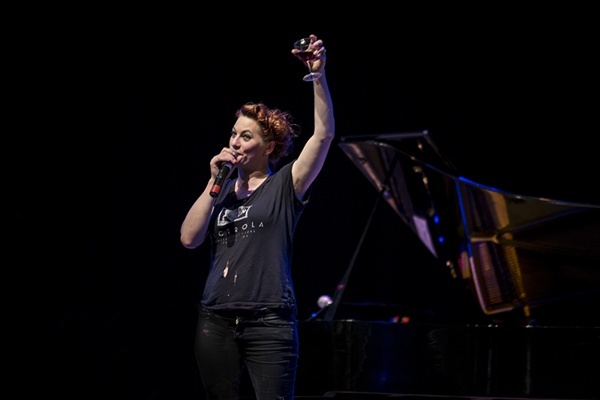 I realised while watching, that I had not seen Palmer perform since before she had her child with husband Neil Gaiman, so that must have been three or four years at least, and marriage must suit her because she was very humorous with her comments and she also played around with her own songs to the amusement of the audience. She even said something that she never thought she would say, where she went on to explain that she was over here mainly to be with her husband who was working over here. The other thing that struck me was how much more powerful the music sounded being played on a grand piano. Whether she had adapted the material for the instrument I don't know, but the music came over as more complex and intricate. 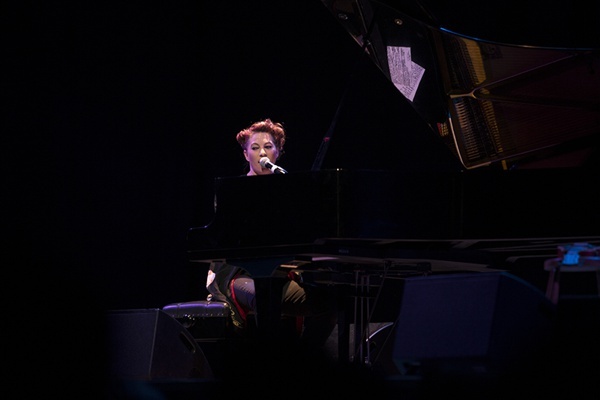 Among the Dresden Dolls' songs, such as 'Missed Me', 'Mrs. O', 'Coin-Operated Boy' and 'Half Jack', as well as both solo and Grand Theft Orchestra songs, there was also new material; there was 'Drowning In The Sound' and a song that I don't remember being named, but it did have the line "you've really got this death thing down" which would probably be a good title in itself. The most amusing, however, was 'A Mother's Confession' which was apparently a true story and had the recurring line (which Palmer got the audience to sing) "at least the baby didn't die" which should tell you everything about it. O'Neill also came back on, with a new dress, to perform 'Vegemite' with Palmer before a fifteen to twenty minute break, which had been introduced as the previous show had had people needing to leave the room for calls of nature. 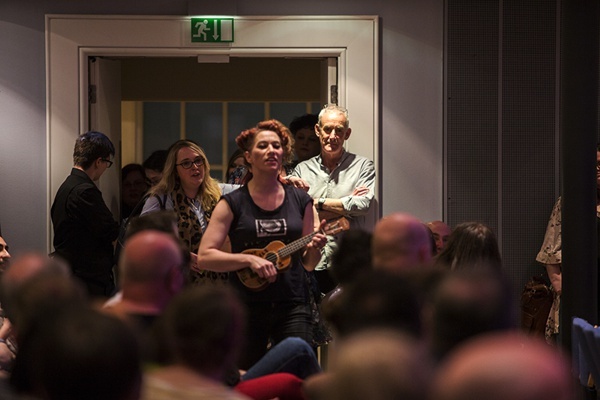 Before she returned to the stage, Palmer had a walk through the bar to tell people that she would be performing Radiohead's 'Creep', which she duly did amongst the people in the stalls. She recalled how the album with her father came about before she sang the Richard Thompson song '1952 Vincent Black Lightning', and 'Machete' was performed as a tribute to her friend Anthony, who died of cancer a few years ago. We even got a cover of The Cranberries' 'Zombie'. There was everything in this show – joy, sadness, humour and serious issues of today. 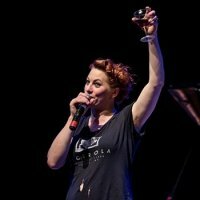 By the end of the night, Amanda Palmer had been on for over two hours and twenty minutes, and when you consider that most of that time it was just one woman and a piano, it is testament to just how entertaining she was. Part One – 'In My Mind', 'Astronaut', 'Ampersand', 'Missed Me', 'The Killing Type', 'A Mother's Confession', 'Mrs. O', 'Drowning In The Sound', 'Vegemite' (with Andrew O'Neill).